Will the Honduran general election be conducted fairly? TEGUCIGALPA — In the shadow of the June 2009 coup that ousted leftist president Manuel Zelaya from office, Hondurans will vote on Sunday to determine whether Zelaya’s wife, Xiomara Castro de Zelaya will become the Central American country’s new president. Despite a polarizing three-way campaign that pits the Zelayas against the two traditional Honduran political parties, with stark divisions over economic and security policy, how secure can Honduras and the region be that the vote will be essentially free and fair — and that the ballots will be counted fairly? In those primary elections, Hernández narrowly defeated popular Tegucigalpa mayor Ricardo Álvarez for the presidential nomination of the conservative National Party, but refused to brook the ballot recount that Álvarez’s campaign requested. Though the two candidates have long since united, no one can say with certainty that Hernández actually won the vote, and that’s left some doubt about the capacity of the Supreme Electoral Tribunal (TSE) to guarantee ballot sanctity in Sunday’s general elections. Though Central America isn’t necessarily always on the front pages, Honduras’s election is especially important to the United States. The 2009 coup was one of the first foreign policy crises for U.S. president Barack Obama, and the United States has devoted increasing military aid in the attempt to combat drug trafficking in Honduras. 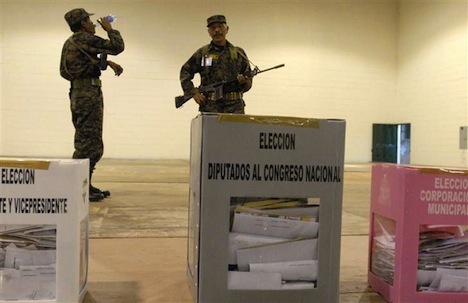 Moreover, Honduras’s general election is the first of four that will be held over the next six months in Central America – El Salvador, Costa Rica and Panama will all choose new presidents between now and May 2014. Hernández’s chief rivals in Sunday’s vote are Mauricio Villeda, the candidate of the more centrist Liberal Party, a Tegucigalpa attorney and the son of former president Ramón Villeda Morales (1975-63), and Castro de Zelaya who, with her husband, left the Liberal Party to form the new leftist Party of Liberty and Refoundation (LIBRE) in 2011. Jacobo Hernández Cruz, a former vice president and former TSE head, however, argued that over the past decade, Honduran electoral authorities have made great strides toward enhancing electoral transparency. Historically, transparency and observation of the vote count represents the greatest check against vote fraud in Honduran elections. But other concerns remain, especially over how the ballot boxes arrive to the polling stations.